Go Thai with The Straits Times Food Online this week. 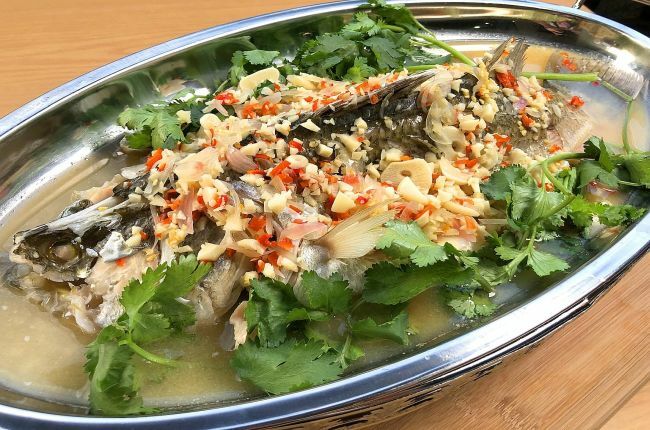 Here are two recipes - with accompanying videos - for irresistible Thai-style pork ribs, Kraduk Moo Tod, and a spicy citrusy steamed fish dish called Pla Kapong Neung Manao. Rinse the sea bass and pat dry. Rub the salt all over the fish including the cavity. Stuff the cavity with lemongrass. Place the sea bass in the fridge. Remove from the fridge 15 minutes before steaming it. To prepare the lime and chilli dressing, bring chicken or fish stock to a boil in a saucepan. Add the coriander roots and simmer over low heat for five minutes. Add the palm sugar, garlic and shallots and allow the mixture to reach a simmering boil. Add the chillies, fish sauce and lime juice. Turn off the heat. Bring the dressing to a simmering boil just before the fish is cooked. Place the fish with its belly flaps splayed out, on a piece of parchment paper (35cm by 25cm) on a steaming plate. Cover and steam for 12 to 13 minutes. The eyes of the fish should turn an opaque white when cooked. Use a fine skewer to pierce the thickest part of the fish. The meat should give way easily if it is cooked through. Transfer the fish onto a serving dish and pour the dressing over the steamed fish. Garnish with coriander. With a mortar and pestle, crush and grind the white peppercorns. Add the garlic and pound into a paste. Add the coriander and pound into a paste. Set aside. Place ribs in a deep dish. Add the fish sauce, light soya sauce, oyster sauce and palm sugar. Mix well. Add the coriander mixture, tapioca flour and cornflour. Mix well. Place in the refrigerator and marinate for at least an hour. Prepare the chilli dip by mixing fish sauce, lime juice, Thai palm sugar, garlic, Thai chilli powder, roasted rice powder and fresh coriander. Remove the pork from the fridge 15 minutes before frying. Heat the oil in a wok over medium heat. Place one-third of the pork ribs into the oil. Lower the heat to medium-low and fry for six to eight minutes until the ribs are browned and cooked through. Remove and place the ribs on kitchen paper to drain off excess oil. Cook the remaining pork in two batches. Ensure there is enough space between each piece of pork rib to prevent them from sticking together and ensure they fry evenly. Serve the pork ribs with the chilli dip on the side.